In Erdenet, we were dropped off at the Selenge Hotel, which we selected it for its cheap prices but stormed off after being quoted a price 4 times what was cited in our guidebook. An hour later we reappeared at the front desk, after an exhaustive visit of the city's hotel alternatives, checking in, yet again, to an ageing overpriced room. Our visit of Erdenet was to comprise the open-cut copper mine, one of the world's largest. We were turned away at the front gates of the mine, now closed to foreign visitors – to be honest, we found the guidebook's claims to be a dubious “You'll need to show your passport at the gate. No one seems to mind if you look around on your own”. 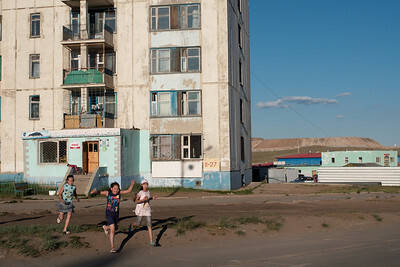 Along with the quadrupling hotel prices, Erdenet was quickly becoming a disappointing destination. 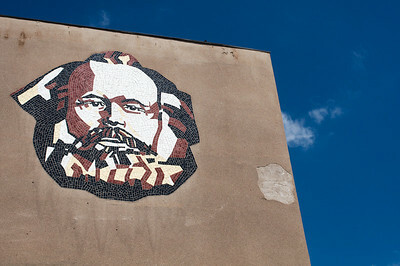 The city was saved by a few gems; a bustling central market, the views from the Fraternity Monument, a Marx mural, a large Lenin silhouette adorning an apartment building as well as several architectural relics of Soviet times. The provincial museum was pretty pitiful, but we have made it a point to visit the world's pitiful museums so we happily added this one to our list. 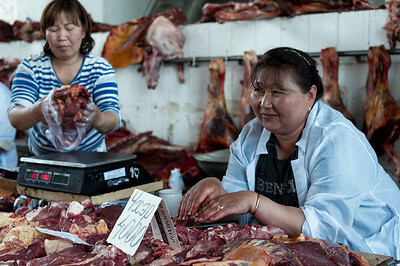 While visiting Erdenet's sights we attempted to figure out how to move on from the city. 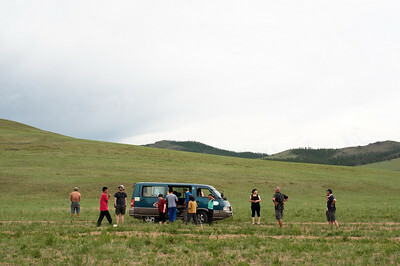 Finding public transportation in Mongolia was fairing to be a seriously challenging experience. After several enquiries, we had a vague notion and conflicting opinions of the location of the city's bus station. Apparently very few people go northwards from Erdenet. The next morning, we left Erdenet by shared minivan, with makeshift seats increasing the vehicles capacity from 8 to 14 people. We began the morning with a fierce ticket negotiation with drivers refusing to let us purchase official tickets in the hopes of making extra money. Leaving Erdenet in the van's worst seats, with the most expensive tickets and with passengers complicit in the over-pricing scheme we were not in the best of moods. We did eventually cheer up. Surprisingly, due to the absurdity of the voyage - long, uncomfortable, nauseating, painfully slow. Our drivers dealt with terrible roads, an ageing overloaded vehicle and a broken suspension (repaired with a rock as a replacement part). How could one stay angry at the drivers trying to squeeze out a few more Togrogs knowing they would have to ply this route over and over in order to make a living? We arrived in Moron, twelve hours later, around midnight. Our drivers, drove us around the dark, unlit city trying to find us accommodation It wasn't until our fourth stop that we found a bed. We ended up banging on the locked doors of the decrepit hotel. Taking advantage of her superior bargaining position, the empty hotel's one employee, a little old lady, made far more money than she should have. The only note I made in my journal about that night said “gross hotel next to police station, 20,000 Togrogs”. In the morning we were lead by locals to a small guesthouse on the outskirts of Mörön, run by the young, enthusiastic Bata and his family. Bata, who spoke exceptionally good English (for the area) had turned his parents' family home into a busy summer guesthouse which he has been running since he was a teenager. 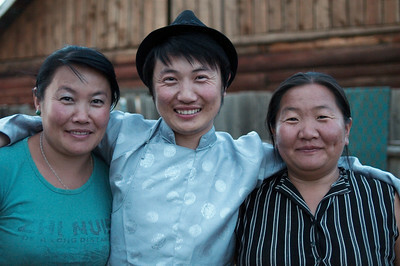 With only thirty days in Mongolia, we spent a week in Mörön, due mostly to the comfort and warmth of Bata's Guesthouse.